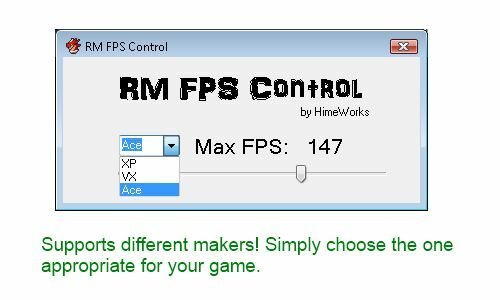 The RM FPS Control is a simple tool that allows you to modify RM game speeds. You can speed up or slow down the game without having to actually modify the game yourself. You can choose any speed that you want, but remember that it only runs as fast as your machine can handle it. This is useful for players that feel a game is a bit too slow. Or maybe too fast. Start your game, then run this tool. When the tool starts up, it will attempt to find an active RPG Maker game. If it does, it should set the currently FPS automatically. Drag the slider to change the max FPS. If your game does not run on RMVX Ace, simply change the engine in the dropdown. Note that if you are using a custom RGSS DLL, this might not work. You can report bugs in the comments below or on my issue tracker or sending an email. I was really hoping this would work on the latest build of pokemon apex but no luck, The exe is called Game.exe and mentioned in another comment and pokemon apex runs on RM XP but it just won;t speed things up. Hello, maybe this is old to answer this, but if your game don’t work it’s because their names, if the exe file named by “game” the program Works fine, but if they have another name, for example: “Uranium.exe of pokemon uranium”, the program don’t work, because many of pokemon games made with pokemon essential have custom name. a few buddies ans additionally sһaring in delicious. And of course, tһanks oon ʏour effort! Works well and everything is speed up very fast! But it’s not neccessary unless you want to speedrun through different games. I typically don’t have the patience to sit through animations and walking around. But then I realized cheat engine achieves the same thing. I was very pleased to uncover this site. I need to to thank you for ones time for this wonderful read!! marked to look at new inforrmation on your site. I tried this on pokemon Insurgence but nothing changed. I switched the tab to XP, nothing changed. Try to run the tool before starting up the game, nothing changed. I’ve tried other things too but no matter what I do it is still super slow. Unfortunately, I do not know how to inject new code into the game so that you could, for example, control it in-game. The only solution I found was to change it from outside. what’s the name of the game you used for example? It is just a sample project created in RPG Maker VX Ace for the purpose of taking a screenshot. Is it difficult to make a “Reset speed” or “Toggle enable” button? *i turn on game load the save file. *then i turn on the fps thingy and set the bar to 120 at least. In the dropdown in the middle, try changing it to XP and then change the speed and see if it works. Can’t download. Need to log in. But i don’t know for what. Not sure what happened there. Password has been removed.